For those projects that require that you use Photoshop or another specialized imaging application, you can summon the Edit With command in Photos for macOS High Sierra. By doing so, you can continue to use Photos as your organizing library, but take advantage of the extensive toolset in Photoshop. The trick is to apply Edit With outside of the normal editing mode in Photos. Here's a video that walks you through all of the steps. In my testing, Edit With worked great with Photoshop. But performance varied with other applications. So some trial and error will be required. But when everything falls into line, this adds helpful roundtripping to your Photos app. And sometimes that's just what you need. Live View on an iPhone is fun, but the Long Exposure mode that you can tap afterward is even better. To create dreamy water effects, just make sure that Live Photo is on with your iPhone. Hold the camera very steady during exposure, and keep your position for a few seconds afterward. This ensures that the stationary objects in the composition will be sharp. Choose your "view" of Live View in Photos for macOS. 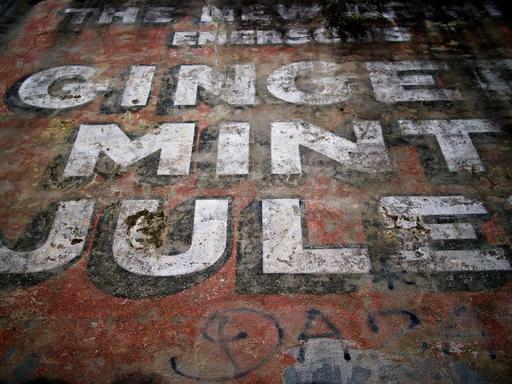 Image by Derrick Story. Water is far more interesting after Long Exposure is applied. Then, open the image in Photos for macOS High Sierra. Go to Edit mode (press the Return key to do so), and edit the image as your normally would. Adjust color, contrast, etc. 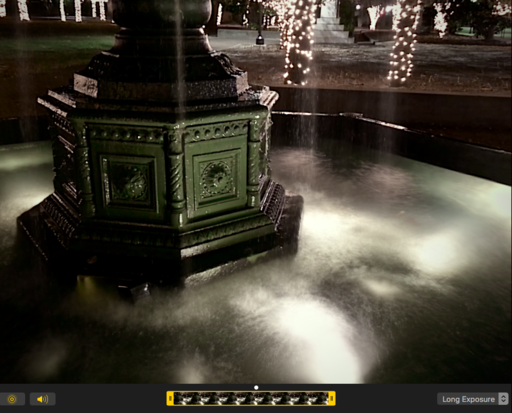 Once you're finished, click on the Live popup menu in the lower right corner and choose Long Exposure. Then just sit back and admire. The combination of Live Photo and Long Exposure enables you to capture flowing water shots without a tripod. It's really something. 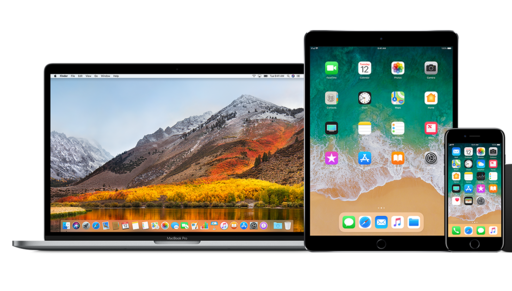 iOS 11 is a robust update for iPhone and iPad users. One of my favorite surprises is the improved screenshot tool. The capture process is still the same: you simultaneously press the power and home buttons to record a screen. 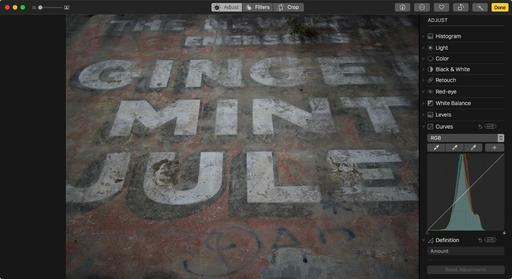 But now, instead of sending the image directly to your Camera Roll, a mini-thumbnail appears in the lower left corner. Tap on the thumbnail, and the image appears with cropping guides around it, plus a markup toolbox below it. You can choose from a variety of writing and highlight instruments with some basic ink colors to annotate the screenshot. When finished, tap Done to send it to your Camera Roll. But wait, there's more! In the upper right corner is an Undo command. 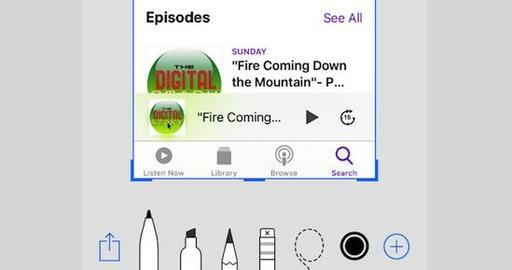 Lower right has a + symbol, that tapped on, reveals a text tool, signature option, magnifier, and more. You can go crazy adding callout arrows, text and even cartoon dialog bubbles. The Share button in the lower left lets you send the image off to a friend directly from this screen. If you have iCloud sharing on, the image will appear on all of your connected devices inside the automated Screenshots album in Photos for iOS and Photos for macOS. If you haven't checked out the new screenshot function in iOS 11, do so now. Become familiar with the tools. That way, you'll put it to use. It's another great way to document our world and catalog the information. Photographers who have been patiently waiting to see the final version of Photos for macOS High Sierra should get their opportunity today. We anticipate the latest OS from Apple to be available by 6PM. Changes to the Photos app include a refreshed UI with persistent sidebar, new filtering options to find your images faster, new editing tools (curves and selective color), and a host of minor refinements. In my testing with the beta version of the new Photos, I found it to be a good iCloud citizen with no disruption to my multi-Mac and iOS workflow. In fact, in general, High Sierra feels like an upgrade that you can embrace sooner than later. Some exceptions include those with Fusion drives and older versions of Final Cut, who should to do some research first. I'll report more on the upgrade process as soon as Apple posts it, and I have a chance to go through the standard process. I've been testing Photos for macOS High Sierra with many of my favorite editing extensions. And for the most part, things have moved along quite smoothly. Those who favor Luminar as an extension for Photos will be happy to read that there are no discernible hiccups. 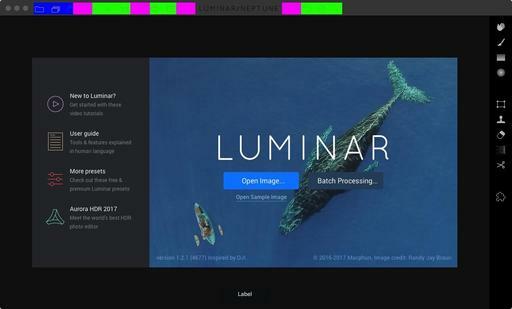 Standalone Luminar photographers only have one minor issue that I've discovered. I'll cover that in a minute. The Luminar editing extension worked well in Photos for High Sierra. Using Luminar as an editing extension, I selected it from the new popup menu, worked on the image in Luminar, then saved it back to Photos without a hitch. I was then able to open the picture (thanks to iCloud) on another Mac running Sierra, and continued working on the photograph. Everything seemed good. 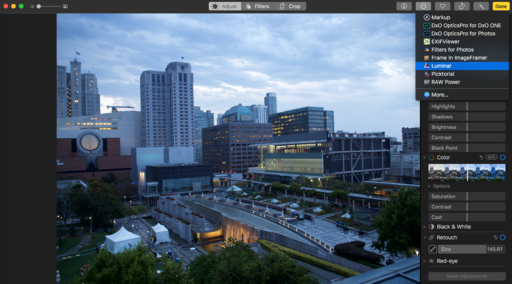 My Luminar processed image was then opened on another Mac running Sierra. Looks terrific! Working in Luminar as a standalone app seems OK as well performance wise, but I am having an issue with the interface, seeing artifacts appear in the top toolbar area. This doesn't seem to affect functionality. But it is a visual distraction. A few artifacts in the Luminar standalone interface in High Sierra. I contacted Macphun, and they've already tackled the issue. We'll see a fix for it soon. Since I've only tested on my machines, I don't know if the issue will appear for you or not. But all things being equal, if you use Luminar as a standalone app, you might want to hold off a few days on that High Sierra update. If you want to master Luminar, you may be interested in my Luminar Pro Techniques Nimble Class on Saturday, Sept. 23. It's online, interactive, and you'll learn new tips and techniques. Plus, I send you the videos from the class too, so you can refer to them as often as you wish. We have a couple seats open, so sign up today. Apple will release macOS High Sierra (10.13) on Sept. 25. The photography highlight is Photos 3 that continues to evolve with UI refinements, more intelligence, and a few new tools. The good news is, the transition seems very smooth. And if you're an iPhone photographer, Photos 3 is the perfect complement. I've been running a beta version of High Sierra on a test laptop, working in Photos 3, and seeing how it interacts with my overall Apple ecosystem. Even during the betas, handoffs were smooth to my iOS devices and other Photos libraries. 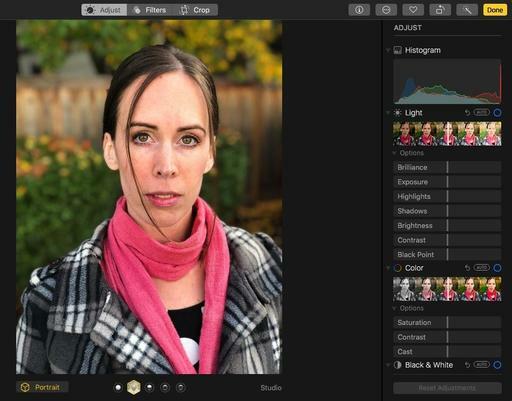 The new tools, such as selective color editing and curves are quite powerful and provide more editing horsepower within the app itself. My primary editing extensions have also been working well with the betas. And in fact, there's even easier access to them in Photos 3. First, stay tuned to thedigitalstory.com. I'll continue with my regular posts about Apple technologies. I've also opened up a second online Nimble Classroom for Photos 3 on Saturday, November 4 (the first session sold out). It's fun and you'll learn a lot. Later this year, my Photos 3 title will be released by lynda/LinkedIn Learning. And after that, the Second Edition to Apple Photos Book for Photographers will hit the shelves. If you enjoy iPhone photography, Photos is the perfect companion to organize and enhance your images. And with the new iPhone 8 and iPhone X coming out, all of this is going to get even better. Much of the video I capture these days is either from the iPhone or my DJI Spark. In both cases, the content is managed in Photos for macOS. To be honest, it's just more convenient than the other options. One of the wonderful aspects of HD and 4K movies is the ability to pull a single frame from the footage and use it as a standalone photograph. The quality is quite good, especially for web publishing. And it's easy to do in Photos. Here's a short video on the technique. Essentially, all you have to do is scrub to the frame you want, then click on the gear icon in the controller. 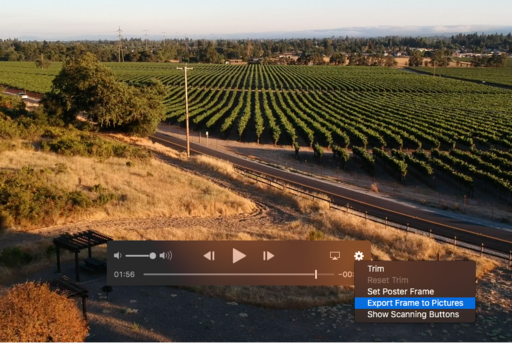 Choose "Export Frame to Pictures" from the popup menu. Photos will send a high quality Tiff file to your Pictures folder. Exporting a single frame from video captured with the DJI Spark. Photo by Derrick Story. At that point, you can bring the image back into Photos, convert it to a Jpeg with Preview, or make a print. Its file name will be the actual frame number from the video, so you might want to change that. And I recommend bringing the image back into Photos where you can add some metadata and keep it with the original movie. Exporting a single frame from video is a great option to have as we continue to capture movies with our portable devices. And it's really easy to do in Photos for macOS. I added a new Nimble Class on Mastering Photos for macOS to my ongoing Nimble Classroom Series. The first session sold out, but seats are available for the November 4th class. You can also explore the world of modern photography with my The Apple Photos Book for Photographers that features insightful text and beautiful illustrations. In addition to the new Curves Adjustment coming to Photos 3 for macOS, we also get selective color. This is a nicely implemented tool that I think you're going to enjoy. Here's a preliminary peek at how it works. 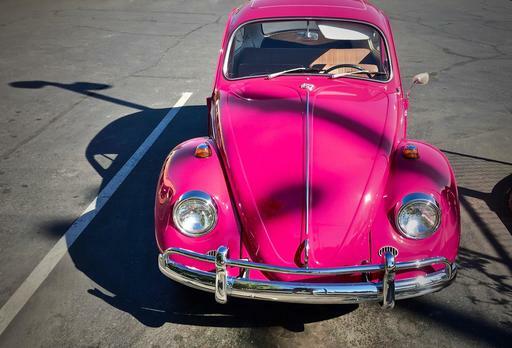 Classic VW Bug. Photo by Derrick Story. Let's say that we wanted to change the red VW above to something a bit wilder. Maybe lavender? It's easy enough to do. 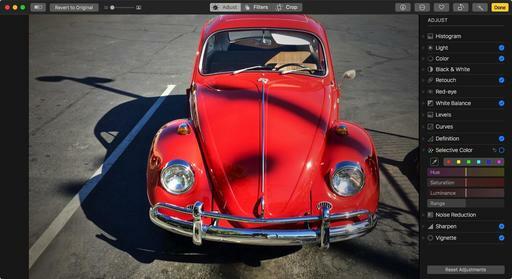 First, open Selective Color in the Adjust tab of Photos 3. Then click on the dropper and select the red color of the car. Now, play with the Hue, Saturation, Luminance, and Range sliders until you get the look you want. VW Bug after Selective Color edit. You can hold down the M key to see the before and after. 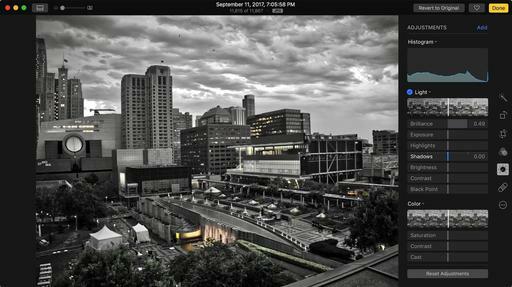 And you can uncheck the blue circle in the Selective Color box to turn on and off the adjustment. Photos 3 will ship with macOS High Sierra this coming Fall. The application is evolving nicely as we work with in through the beta builds. And I think Mac users are really going to enjoy this latest version of the software. Here's the final version of the image. New Nimble Classroom for Photos 3 Added! My first Nimble Classroom for Photos 3 sold out. So, I've added another session for Nov. 4. If you want to learn this app inside and out, plus its wonderful editing extensions, you may want to sign up for the November class. We're going to have a blast! Photos for macOS version 3 will ship with High Sierra. As part of the public beta, we're getting a chance to look at this app and some of its new features. One that I think a lot of photographers will be interested in is Curves. 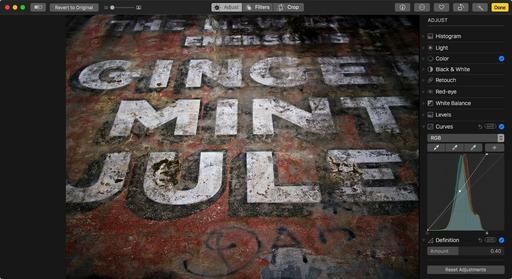 Image after applying Curves in Photos 3. Image by Derrick Story. As it stands now, this implementation of Curves is on the basic side in terms of features (no presets, etc. ), but effective. We have highlights, midpoint, and shadows droppers. We can target specific tones and add them to the adjustment curve. And we can work in individual channels, or all channels rolled up in RGB view. There are also the normal controls that you would expect such as Auto Curves, reset adjustment, and the ability to turn it on and off without affecting the other sliders. Final image output from Photos 3. Picture by Derrick Story. Sometimes it's handy to target a specific tone and make an adjustment. In Photos 3, we'll be able to do just that with Curves. I'll be covering Curves and all the new Photos features in my upcoming Nimble Classroom on Photos for macOS, October 7. Interact with me and others from the comfort of your home. You might also be interested in exploring the world of modern photography with my The Apple Photos Book for Photographers that features insightful text and beautiful illustrations.